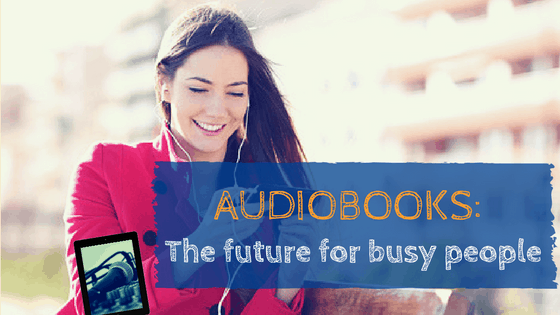 This post was written by Simone Feiler Clark, owner of Brisbane Audiobook Production, who makes it easy to get your audiobooks recorded professionally and listed online. Work, children, school, study, partner, house, travel, sport, exercise, pets, cleaning, volunteering… the list is endless. Grr, it’s crazy, and then there’s time you want to fit in for yourself; hairdresser, massage, waxing, shopping, pool, beach, holiday, etc… With this busy-ness, do you ever get the opportunity just to chill your mind, just chill? One of the most important pieces of advice my children receive at school these days is to read. Not only is it educational, but as you probably know, it can definitely be relaxing. How do you feel after you read some of your book? Does it take you away from your mundane? Does it educate you? Does it inspire you? Or do you not know, because: how the heck in your incredibly busy life do you ever find time to read? The answer is quite simple really: with audio books. Back in the 80s we used to walk around with ghetto blasters, blaring our favourite songs. It was kind of cool, because if we had the ghetto blaster then we could hear whatever we wanted. The competition could be fierce though, particularly if someone else had their ghetto blaster on. Not playing cool music… how embarrassing. Thankfully today, headphones are cool. And we can listen to anything we want to, anytime we want. It doesn’t disturb anyone while we listen… and we can listen to books as well as music. Thankfully, today headphones are cool. And we can listen to anything we want to, anytime we want. It doesn’t disturb anyone while we listen… and we can listen to books as well as music. Nowadays, Australian consumers have access to a huge catalogue of audio books — across all genres — from around the globe, including an ever-increasing pool of Australian-made content. Topics among the most popular audiobook categories include: self-help, children’s titles, best-selling fiction and business and these fields are expanding at a very rapid pace. So where are people listening? Well, in a survey of 1034 Australians by Longeran Research, taken for Audible last year, 49 per cent of audio users said they listened while commuting, 44 per cent said while on a road trip, 38 per were doing housework while they listened and 30 per cent were getting fitter listening during exercise. Furthermore, research by the biggest player in the audiobook market, audible.com.au, shows that three million Australians have listened to an audiobook in the past year. That’s 3 million that could have listened to your story! As an author, consider making YOUR audiobook available, as the number of Aussies listening has increased by up to 30% annually! It’s a billion-dollar industry in the US that has gained traction here in Austalia since Amazon-owned Audible set up an Australian audiobook store two years ago.Image: bought from Dreasmtime. Image: bought from Dreamstime, the affordable photo repository.